Planets to Be Discovered in the Outer System? Having just looked at the unusual ‘warped’ disk of HD 142527, I’m inclined to be skeptical when people make too many assumptions about where planets can form. Is our Solar System solely a matter of eight planets and a Kuiper Belt full of debris, with a vast cometary cloud encircling the whole? Or might there be other small planets well beyond the orbit of Neptune, planets much larger than dwarfs like Pluto but not so large that we have been able to detect them? Certainly Carlos de la Fuente Marcos and Raúl de la Fuente Marcos (Complutense University of Madrid), working with Sverre J. Aarseth (University of Cambridge) think evidence exists for this proposition. The scientists are interested in how large objects can affect the trajectories of small ones, and in particular what a comet named 96P/Machholz 1 can reveal about how such interactions work. They’re focused on the Kozai mechanism, which explains how the larger object causes a quantified libration in the smaller object’s orbit, and use the Jupiter-family comet as a reference to understand the processes that may be happening in the outer Solar System. …the architecture of that region is unlikely to be the result of a gravitationally unperturbed environment. If there are two planets, one at nearly 200 au and another one at approximately 250 au, their combined resonances may clear the area of objects in a fashion similar to what is observed between the orbits of Jupiter and Saturn. Image: This is an orbit diagram for the outer Solar System. The Sun and Terrestrial planets are at the center. The orbits of the four giant planets, Jupiter, Saturn, Uranus and Neptune, are shown by purple solid circles. The Kuiper Belt, including Pluto, is shown by the dotted light blue region just beyond the giant planets. 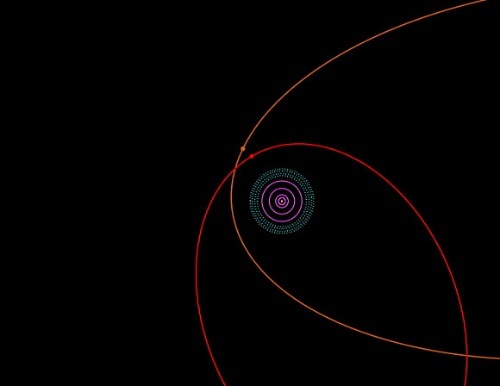 Sedna’s orbit is shown in orange while 2012 VP113′s orbit is shown in red. Both objects are currently near their closest approach to the Sun. Credit: Scott Sheppard. So while we have no evidence for planets the size of Jupiter or Saturn moving in circular orbits in the outer system, the possibility of small planets beyond Neptune may still be in play, even if a wave of recent interest has resulted in no detections. The current authors think their results are unlikely to be the result of perturbations caused by Neptune or of observational bias, even while stressing that their work is based on the behavior of a relatively small number of objects. Can a moderate-sized planet affect objects beyond Pluto’s orbit in ways that New Horizons could detect? The authors think it’s possible, and it’s an interesting thought, particularly now that New Horizons is actually entering the first of its encounter phases for the Pluto/Charon flyby. The papers are de la Fuente Marcos et al., “Flipping minor bodies: what comet 96P/Machholz 1 can tell us about the orbital evolution of extreme trans-Neptunian objects and the production of near-Earth objects on retrograde orbits.” Monthly Notices of the Royal Astronomical Society Vol. 446, Issue 2, pp. 1867-1873 (abstract / preprint) and de la Fuente Marcos, “Extreme trans-Neptunian objects and the Kozai mechanism: signalling the presence of trans-Plutonian planets,” Monthly Notices of the Royal Astronomical Society Vol. 443, Issue 1, pp. L59-L63 (abstract / preprint). On 2012 VP113, see Trujillo & Sheppard, “A Sedna-like body with a perihelion of 80 astronomical units,” Nature 507 (27 March 2014), pp. 471–474 (abstract). Space been so vast there is bound to be large objects out there waiting to be discovered. This website has more information on the topic of Sedna and 2012 VP 113. I quickly skimmed the de la Fuente Marcos paper. What I would like to see is a comparison of probabilities to decide whether the proposed hypothesis of ETNO interaction is more or less likely than due to eons of interactions with passing stellar systems. The probability of perturbations and exchange of bodies with other systems increases as the direction of the pass is more aligned with the solar system’s plane. This could explain the distribution of orbital elements as well. It may require the rotation of the other system to be opposite to our own so that the relative velocities facilitate exchange. This mechanism would also permit retrograde orbits in at least a minority of cases. Has this type of analysis ever been done? If valid it would make visiting these ETNO more interesting. More objects right here in our own solar system to explore and colonize and to use for mineral resources. A planet that big at 250 A.U. from the Sun might have enough internal radioactivity to keep a warm interior for a very long time. One can imagine an icy surface that insulates the interior from radiative cooling. Thus, aquatic life forms might develop some of which could evolve perhaps into personal beings. Then this begs the question as to whether such super-Earths may populate interstellar space while being occasionally passed from one star to the next star in gravitational capture. Our solar system is already known to be more than “eight planets and a Kuiper Belt full of debris, with a vast cometary cloud encircling the whole.” This description fails to distinguish between tiny Kuiper Belt Objects and small planets in the Kuiper Belt when these two types of objects are very different from one another. Dwarf planets have just about all the characteristics of their larger counterparts–they are rounded by their own gravity, have geology and weather, and are differentiated into core, mantle, and crust. Lumping them together with “debris” blurs the important distinctions between these two types of objects. Our solar system has a minimum of 13 planets and may very well have more, whether Pluto-sized or larger, in its outer regions. Every discovery of a new exoplanet system shows us we need to revisit what we thought we knew about planet formation. There likely are several different ways to form solar systems, many of which we have yet to learn. “Lumping them together with “debris” blurs the important distinctions between these two types of objects.” — You’re right, of course. It was a sloppy phrase. Running the numbers on detectability, I have my doubts. For an object with composition similar to Pluto/Charon (density ~ 1/3 Earth) to have 10 Earth masses, it would have to have 30 Earth volumes implying R~3.1x Earth, disc area ~10x Earth. Charon is quite visible with the best telescopes, and has disc area ~ 1/100th of Earth. So our hypothetical massive dark planet has 1000x the reflective area of Charon. Ok, if the dark planet is 10x further from the sun than Charon it would receive 1/100th of the illumination and also be another factor of 1/100th dimmer to an Earth observer due to distance. All told, the dark planet would be only 1/10th dimmer (2.5 magnitudes) than Charon. Best guess, such an object would have apparent magnitude 19.3, maybe a bit higher if it has low albedo, but no more than one magnitude. Hubble can detect down to magnitude 30. The Sloan Digital Sky Survey can detect down to magnitude 22. So such an object – if it exists – has already been imaged. So, where is it? Well, if the distance is >250 AU, the proper motion would be minimal. But still, such an object should have a different color profile than most stellar objects. Certainly worth making the search a crowd source project for some postdoc. If a diligent search of the database is undertaken and nothing is found, that would set upper limits on how big such a dark object could be. How does the following paper and the discussed paper account for each other’s conclusion.. http://arxiv.org/pdf/1501.00941v1.pdf , one paper says about a low probability of a high Albedo object and other just says 2 objects.. So are we them looking at 2 very large DARK objects which then cannot be detected by optical scopes w/o a star in its vicinity?.. in which case New Horizons cant detect it either.. So detecting a large dark cold object and its probability becomes the next challenge. PS: Gaia is already operational at L2 and gathering parallax data on objects down to magnitude 20. If there is a super Earth in the region in question, Gaia will detect it. The next few years will see the “Planet X” hypothesis either confirmed or definitively busted. An object more massive than earth with the composition of Charon would be much denser because of compression. Probably a density close to 4 vs 2 for an earth mass. So disk diameter should be 1,1 to 2,4. We have no clue regarding the albedo of such a planet, as it would be volatile rich in the outside (can be clear or very dark) so albedo could be as low as 0,04 (some gazeous exoplanets are very dark). I believe there is at least one massive object lurking in the dark. Probably quite Weird (very dark?) or at aphelion of an eccentric orbit not to have been seen. It’s perfectly compatible with Nice model (ejection of planetary embryo). Joy: I hope you’re right. BUT; the recent revelation that GAIA’ s sensitivity has essentialy been CUT IN HALF ue to light polution problems makes me wonder. Also, since these objects are among BILLIONS in the field of study, it may take DECADES to find them. The best way to find them would be to act on the paper due out later this year with either existing space telescopes (i.e. Hubble and Spitzer) until 2018, when both are decommissiones, and then continue looking with JWST. Finally, from a pure statistical standpoint, I think it is INEVITABLE that super-earths MUST EXIST in OUR solar system. We should thank our lucky stars that they ARE extremely far removed from t he inner solar system, like Fomalhaut b is. Agree that different assumptions would give different results. Assuming a 10 Earth mass ~ Earth density object with extremely low albedo 0.04 would add 3.3 magnitudes to the calculation = magnitude 22.6. If we move Planet X from the conservative 300 AU in my previous calculation to 250 AU the magnitude prediction drops to 22.1 This would still be well below Gaia’s sensitivity and marginal for SDSS. Note: This is actually brighter than some TNOs we have detected, 2012 VP113 is magnitude 23.4. Assuming no internal heat source, Planet X with albedo 0.04 would by 17 K at 250 AU. It’s peak radiation would be at 166 microns = 1.8 terahertz That would have been in the realm of the Herschel Space Observatory, which unfortunately ran out of coolant. So no help from submillimeter astronomy. Even so, a super black, super Earth at 250 AU would be quite detectable with existing instruments. So, where is it? The null hypothesis is that the solar system beyond the Kuiper belt has been disrupted innumerable times by close stellar passes since formation. The elusive Planet X is not necessary and becomes less likely to exist the longer it remains undetected. I have to believe that Gaia will produce data on both parallax and proper motion of each object it oberves, and that no matter how many BILLIONS of objects are observed, those that are close to the sun and show orbital motion to boot will stand out like a sore thumb immediately. No DECADES of searching necessary. It would be surprising to me if previous astrometry missions had not already ruled out anything of the size and distance we are speaking of, here. Even if there are more planets out there, would they be admitted to be planets? Or would some excuse be invented to deny them that title? beyond Kuiper belt should reside two Mars size planets or one Earth size one. Since then giving the same lectures he has refrained citing Earth size planet but is confident about Mars size one(s) – A four Pluto-size planet(s). When juxtaposed with this paper then we get an extraordinary result. The only question I have on mind will Dawn be able to make such measurement? I know the Dawn has been specifically built to measure Kuiper belt but this is very very recent discovery of the belt propertie. Could such observation be incorporated into Dawns’ science program? Here is Dr Michael Brown’s presentation. At 49 min he makes the statement about Mars / Earth size object beyond Kuiper belt. Per Pluto’s dwarf planet definition the theoretical discoverable planets would be called dwarf planets despite being Mars / Eart size (or bigger). Discovery of those bodies will open a bigger can of worms than demotion of Pluto planetary status. Sedna, not Eris, Sedna & everything Sedna’s highly ecliptic orbit reveals of outer edge of the Kuiper belt. Dynamics-wise, distinguishing between the 8 planets and the large trans-Neptunian objects (not necessarily KBOs, e.g. Eris in the scattered disc) makes a great deal of sense. The “Pluto is a planet” crowd are pushing a nonsensical description of the overall architecture of the solar system which blurs away the important differences between Pluto and friends and the 8 major planets. If you want a term that encompasses the differences in the objects themselves, then by all means come up with one, but “planet” is a bad fit especially given the historical reclassification of Ceres outside the list of major planets, and such a term should also encompass the major planetary satellites (yet another reason why “planet” would be an inadequate term for this class of objects). Personally for me an interesting question is why the solar system does not have a set of multiple intra-Venusian planets, rather we have Mercury which is something of an oddball. In particular, to get Mercury to have as small a mass as it does, it seems the initial conditions for the inner solar system would have to put the inner edge of the disc as far out as 0.7 AU. Recently saw an article about a presentation at the recent AAS meeting which suggests that our solar system originally could have had a system of several planets inside the orbit of Venus that were subsequently destroyed by dynamical instability, leaving Mercury as the last surviving remnant of the process. New Horizon, not Dawn. Hoping New Horizon can surprise us in findings we never expected beyond Pluto and bring clarity on such findings / calculations we are discussing. Looking at the image above, if you keep the ‘dots’ as references, and flip the arcs 180 degrees, you would have the orbits of a deep space object that arrives on a long elliptical and returns. Perhaps Proxima Centauri? I thought the WISE mission already ruled out super earths to a distance of 250 AU? Does anyone recall the lower limits of the WISE mission? I thought that WISE only ruled out Jupiters, Saturns, and Neptunes. I don’t even think WISE would detect Uranus (due to the lack of an internal heat source) at 250AU. Correct me if I am wrong. I wonder if everyone has given up on new planets as the cause of periodicity in mass extinctions yet. It wasn’t that long ago that ago that they were being held up as one of the few explanations of their metronomic regularity. This I would believe, based on a power law distribution of TNO discoveries so far extrapolated into a vast volume of space. I would put long odds against anything Earth mass out there and extremely long odds against super Earths. To get anything that big, one is positing proper planets ejected from <30 AU. But, such ejected planets would either escape the solar system entirely or if still gravitationally bound to Sol would be in cometary orbits with perihelion around 30 AU or less. I read on wiki that if a planet in interstellar space had a thick enough atmosphere, it could have a temperate climate with oceans due to geothermal heating. Assuming this is true, it still wouldn’t have much complex life due to the lack of sunlight. If we colonized such a place, we’d probably have to seed and bioengineer the planet. I wonder if a large/complex ecosystem could be maintained on a planet with only starlight and geothermal heating. After all, life on earth is almost completely dependent on the sun. Considering a distant earth mass planet (250 UA or so). If it has a composition typical of comets, it should be CO rich (7% of H2O). It could have accreted when nebular gaz was gone in it’s surrounding, hence no H2, He (Neptune is already severely depleted). Although it’s very cold out there, the internal heating should allow it’s surface to be about 30-40K, so it could have a CO atmosphere. 250UA is outside the exosphere, hence high flux of radiation. Has anybody simulated a very cold CO dominated atmosphere? I’ve harped on this before, but I really would like there to be Mars-to-Earth sized planets out there at about that distance. They could be big enough to retain primordial helium in their atmospheres (depending on how cold their atmospheres would be at the exobase), but not so big that getting on/off would be too difficult, as the gas giants would be. Such planets could be the best places in the solar system to mine 3He, if that isotope becomes useful for fusion energy/propulsion. Big news! The latest PROCESSED image of Ceres is DEFINITELY better than the BEST Hubble image! A couple of large craters are DEFINATELY visable. Suprisingly, although Ceres (unlike Vesta) is clearly symetrical, it appears to be slightly OBLATE; so much that it looks earily similar to Saturn. New Horizons is great and all, but there’s detailed trajectory data for Pioneer 10 & 11 that extends past 80AU from the Sun (more than 2x the distance NH has covered) as well as Voyager 1 & 2 which are much further out. That data would be more useful to tease out any undiscovered planets than New Horizon. The ETNOs and the Kuiper Cliff don’t necessarily mean there’s a planet out there; they could be relics of a close encounter with a passing star or large free floating planet or maybe leftover “damage” from the Sun’s natal cluster. @Andy – I agree; compare Pluto to the 8 planets and it’s not even close. Mercury is 25x more massive than Pluto, but half the mass of the next smallest planet (Mars). “■ A 47 arcminute feld of view. ■ HgCdTe and Si:As 10242 detector arrays at 3.4, 4.6, 12, and 22 µm with a plate scale of 2.75”/pixel. In finding no trace of Planet X, the conclusion is that the Sun has no further Saturn-sized planets out to 10,000 AU and no more Jupiters to 26,000 AU. Scrolling down [url=http://www.space.com/24989-planet-x-search-nasa-telescope.html]their page[/url] I found a graphic showing WISE’s detectability limits (log axes) so this may be good for a guide although the y-axis is in Jupiter-mass units (the x-axis is AU). Might help? Scrolling down their page at http://www.space.com/24989-planet-x-search-nasa-telescope.html I found a graphic showing WISE’s detectability limits (log axes) so this may be good for a guide although the y-axis is in Jupiter-mass units (the x-axis is AU). Might help?